The definition of quantum from Dictionary.com is “the smallest quantity of radiant energy, equal to Planck’s constant times the frequency of the associated radiation”. This definition is essentially referring to the Planck relation (E=hf) equation that was defined by Max Planck. He later went on to win the Nobel prize in 1918 for his work on energy quanta. What Planck discovered was that photons (including light) are “bundles” of energy, as he called it, not a continuous wave. Numerous physicists were referring to this bundle of energy as quanta (plural of quantum) in the early 1900s and now it is commonly referred to in this way. When photons travel in waves, they are discrete bundles of energy – quantum. When an electron is in orbit around an atom, it is found at quantum energy levels. The electron can only be at specified orbitals (energy levels). When the electron transitions between orbitals, it is referred to as a quantum leap. The relationship between the electron in an atom being at quantum energy levels, and the photon being quantum packets of energy, is not surprising. The electron transition to lower orbitals is what creates a photon. Quantum is difficult to comprehend because the current explanation of the subatomic world is very different than the world larger than the atom. It is currently believed that the quantum world has a different set of rules in the universe. However, with a slight change in our way of thinking, the bridge between the quantum world and the world in which we see becomes apparent. Both live by the same rules of physics. To change our way of thinking, we need to consider that the proton has both an attractive charge and a repelling charge. The components of the proton and how this may occur is presented in a page explaining the proton. It’s still difficult to comprehend, so an analogy will be used to explain quantum. In the analogy, the ping pong ball is an electron in an orbital around a single proton. The proton has an attractive force (the gravity of Earth in this case) and a repelling force (forced air). The misunderstanding of the proton and this property of being attractive and repulsive is what leads to the confusion of quantum. Imagine the same experiment conducted on a heavier planet with stronger gravity. The ping pong ball will be closer to the blow dryer when it settles into position. This is the equivalent of more protons in an atom. Imagine the same experiment with the blow dryer on high setting (instead of low setting). The stronger air forces the ping pong ball up further, but there are only certain settings on the blow dryer. This is the equivalent of more protons in alignment in the atom causing orbital jumps. Imagine the same experiment with additional blow dryers pointed at the ping pong ball from other angles and distances. It will cause the ping pong ball to have a new location where it can rest. This is the equivalent of additional electrons in the atom that have repulsive forces, changing orbital distances. The ping pong ball scenarios are the best way to explain the forces of an electron in an atom. There is sufficient proof of this model from energy wave theory: 1) the proton’s structure matches beta decay experiments, 2) orbital distances were accurately calculated, and 3) electron ionization energies were calculated for the first twenty elements. 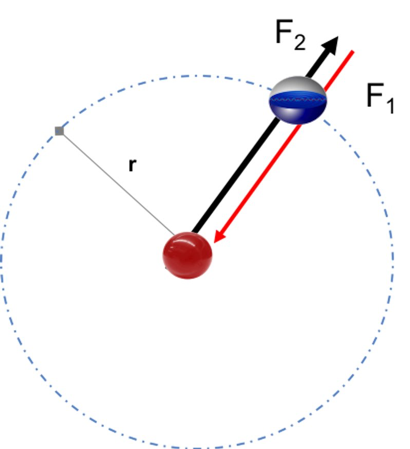 An example of the atom and the attractive force (F1) and repulsive force (F2) is illustrated below. The point where forces are equal becomes an orbital. Each orbital has an associated energy level matching the attractive, electric force for the electron at that distance. The proton’s explanation only solves one part of the quantum mystery. It explains how an electron stays in orbit around a proton when it does not do the same for a positron. It explains how a stable atom can have different orbitals depending on the configuration of its nucleus. But it has not (yet) explained the photon. Energy is always conserved but it changes forms. 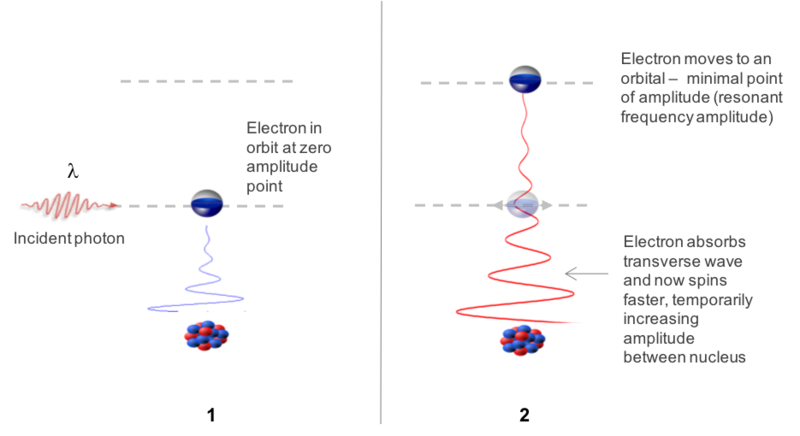 When an electron is captured in an orbital closer to the atomic nucleus, it vibrates and creates a transverse wave. It is transferring longitudinal wave energy to transverse wave energy. The photon is a transverse wave. When it is created from an electron in an atom, it is a short-lived vibration, thus it becomes a discrete packet (quantum) of transverse wave energy. This is the photon and its properties can be modeled in energy wave theory with a transverse energy equation, in which the energy gained is exactly equal to the energy lost in the calculation using the longitudinal energy equation. 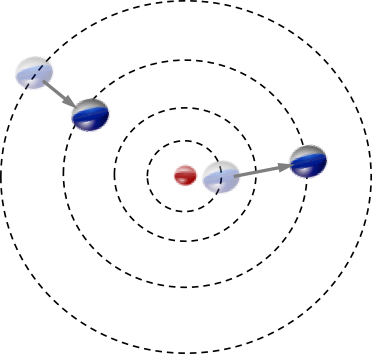 An electron can be captured from outside of the atom, or it can change between orbitals, such as the illustration below. But as explained in the structure of the proton in the ping pong ball example, there are specific distances where the forces will be zero that act on the electron, depending on the number of protons and the placement of other electrons in the atom. Below is one of the examples of the creation of the photon from the electron’s vibration. The photon’s quantum energy can also be absorbed, converting transverse wave energy back to longitudinal wave energy. The details of how photons at specific frequencies are absorbed by electrons is provided in the photon interactions page. In short, transverse waves cause a faster spin of the electron, increasing the longitudinal wave amplitude between the nucleus. This forces the electron away from the nucleus, but it eventually returns to the ground state as the amplitude gain is temporary. Quantum should not be a mysterious phenomenon that only applies to subatomic particles. The energy levels are a result of multiple forces in the atom acting on an electron, and the electron’s motion converts energy between two different wave forms: longitudinal and transverse. Video – What is Quantum? The What is Quantum video below provides an explanation of the strange behaviors of particles at the subatomic level.